I love Purim because it is so packed with pleasant mitzvahs, it's almost hard to fit them all into just one day! We listen to the megillah in the evening and the morning - whizzing, banging and booing Haman's name. Then we send shaloch manos, baskets of treats to our friends and families in need, give gifts of money to people who are less fortunate than we are, and enjoy a delicious Purim feast. Purim is a day to be happy. A day to forget about our physical problems, material problems, even our spiritual problems. Forgetting our problems on Purim doesn't mean getting drunk and ignoring our problems, hoping they will go away. It means, knowing that G-d is everywhere and also in YOUR life. When our relationship with G-d is strong, all of our problems are solved, so don't tell G-d how big your problems are. Tell your problems how big G-d is! Purim is such a busy day, it's hard to remember that it's a powerful time to pray. Purim is a day when EVERYTHING can turn around for the good. So, be sure to take some time to talk to G-d and ask for everything you need and for the protection of the Jewish people. There is a meditation I like to do while I'm twirling the Purim gragger, the special noisemaker we use to blot out the name of the evil Haman who tried to destroy the Jews. I ask G-d to turn around everything that doesn't look good in my life and in the world - to turn those things around so that they will look good and BE good! Happy Purim from the Shagalovs! The Artnotes above are from my newest coloring book for families and adults called, "Happy Purim!" (see below). NEW and on sale just until Purim! Available for Instant Download and Print! ”Happy Purim" is the second book in the "Color Your Soul" series of family and adult coloring books that integrate the relaxing, meditative art of coloring with deep Chassidic secrets of Judaism. 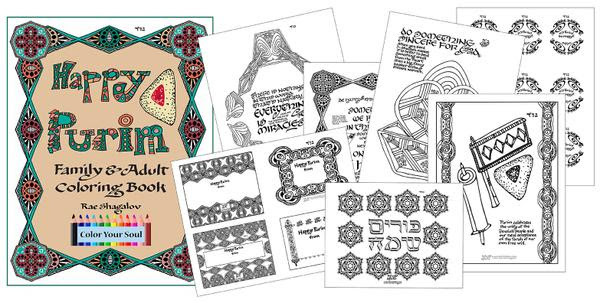 It includes fun designs to color and unique Jewish quotes from contemporary Jewish masters written in beautiful calligraphy. There are labels and cards in various sizes that you can customize and use for your shalach manos, and any page can enhance your Purim gifts, rolled up as a scroll and tied with a ribbon. Includes 20 coloring pages plus 7 styles of cards and labels in various sizes. This is a GREAT deal because you can print out as many as you like for your personal use, including family members living with you. You may also give printed versions as gifts after you have colored them in or added your own created touches, and if you are a classroom teacher, you may also print for the students in your class.